I was born and grew up in rural Southern Appalachia. Books and stories were my pathway out of the holler and into a world of hope and possibility. As a child and teen, I read and listened voraciously, and those stories found in books helped to save my life. Without them, I am not sure where I would be right now. During my early years as an adult, I searched for a career that would pair my enthusiasm for literacy and literature with my profession. I finally found that perfect match as a librarian. As a middle school librarian, I fell in love with Young Adult literature, books written for teens between the ages of 13 and 18. When I am asked why I seldom read “adult” books, I respond that I believe that some of the best books—both fiction and non-fiction—written today are being published for teenagers. In my defense, I am quick to cite numerous studies that indicate between 48–52% of the YA books being checked out at public libraries and purchased in book stores or online are to readers over the age of 24, in other words, readers like myself. What does that tell us? That these books written for teens possess value and quality for people of all ages. In 2017, I had the opportunity to serve on the Michael L. Printz Award committee for the American Library Association. This prestigious award is administered by the Young Adult Library Services Association (YALSA) and sponsored by Booklist. The winner and honors must exemplify literary excellence in young adult literature. Over the course of 12 months, I worked with a committee of eight other librarians from across the US. As a committee, we read hundreds of novels, biographies, and non-fiction titles written for teens. We convened online and in person, wrote about the books we had read, and in February of 2018 met in Denver to decide which titles we would select for the Printz Award. After two days of intense debates, we chose diverse five titles. The committee selected We Are Okay by Nina LaCour as the winner of 2018 Printz Medal and recognized four books with Printz Honors: The Hate U Give by Angie Thomas, Long Way Down by Jason Reynolds, Vincent and Theo by Deborah Heiligman, and Stranger the Dreamer by Laini Taylor. As the awards were being announced at the ALA conference on February 5, I sat in a packed auditorium as tears rolled down my face. And why is this my Humanities Moment? Because this moment validates what I have always felt about YA literature. 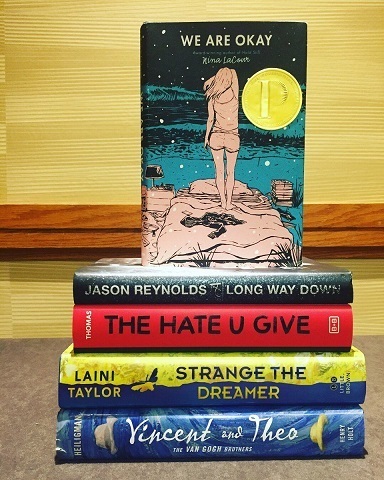 My experience on the Printz Committee and the five books we selected affirm two of my core beliefs—that some of the best books being written today are being published for teens and that anyone, young or old, can find beauty and meaning in the pages of YA. As a middle school librarian, I remind myself that I have the power to hand a student the right book at the right time in his or her life, a story that might change a life forever. And that is the power of literacy for teens….showing young readers a pathway to the future and inspiring them with hope and promise.